An individual neuronal cell of the worm C. elegans (captured through the visualization of calcium dynamics using the calcium sensor GCAMP6). Imaging of single neurons in the brains of behaving animals, like in this photo, allowed Yale researchers to reconstruct how single neurons change based on experience, and how their plasticity mechanisms then compute sensory information to actuate a memory. The nervous system has the capacity to change based on experience. This plasticity is thought to underpin the formation and retrieval of memories. How plasticity of individual neurons contribute to learned behavior is a fundamental, and unanswered question in neuroscience. 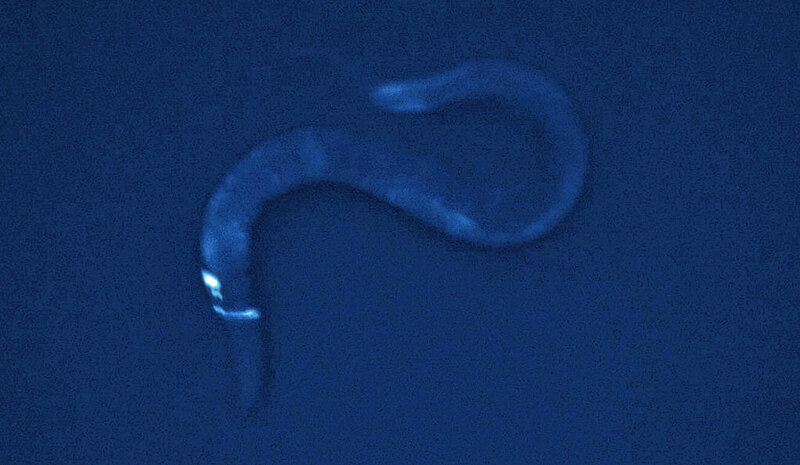 In the January 4 issue of the journal Neuron, Yale scientists show that two plasticity mechanisms act within a single neuron to express a memory in the worm C. elegans. C. elegans can be trained to prefer a temperature, and the Yale team, led by neuroscientists Daniel Colón-Ramos and Josh Hawk, studied what happens at the cellular level when animals learn to prefer a new temperature. They found that a sensory neuron in the worm can integrate two plasticity mechanisms to guide learned behavioral preferences. Sensory adaptation allows the neuron to act as a sort of compass, telling the worm which way it is bearing on a temperature gradient. Presynaptic plasticity acts as an “information gate” that, based on learned behavior, governs whether temperature information is relayed to other neurons or not, thereby controlling its movement. Together, these mechanisms create a single-cell logic system that explains how the animal both senses temperature, and responds to it based on a previous memory. “Our work shows that each individual neuron is capable of acting as a computer, integrating plasticity mechanisms to process information that initiate complex behaviors,” said Colón-Ramos. Be the first to comment on "Neuroscientists Demonstrate Integration of Plasticity Mechanisms within a Single Sensory Neuron"